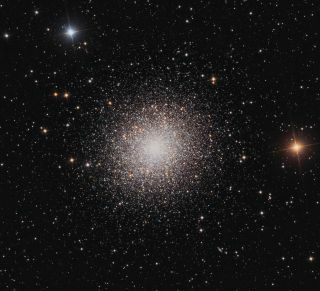 The hundreds of thousands of stars that make the mighty Hercules globular cluster shine bright in this skywatching photo. Astrophotography team Bob and Janice Fera took this image in May 18 and 20, 2012 from Eagle Ridge Observatory in Foresthill, Calif. These blue stars shine a bluish-white because their core temperatures are extremely hot. Bright red stars found within the cluster are cooler because they are older stars that have expanded in size. These stars are often called ancient red giants. The Feras used an Officina Stellare RC-360AST 14" f/8 Ritchey Chretien Cassegrain telescope with two-element field flattener to observe the M13 cluster. An Apogee Alta U16M CCD camera with Astrodon filters was used to capture the image.